Due to the low ceiling and complicated interior, inside Science Museum has relatively little insight. So we designed so that several individual graphics would look as if they were combined and made one big panorama image. 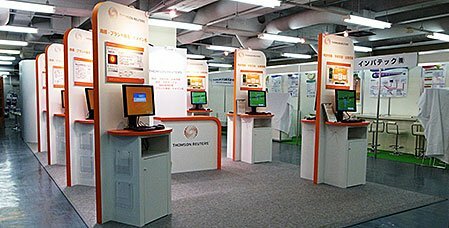 Thomson Reuters successfully acquired the biggest number of visitors ever in their booth. Thomson Reuters is one of the world’s leading companies that provides information for patents, medicines and academic documents.